You can still register for the last webinar in our Workforce 2020 series, Bridging the Skills Gap: The Learning Mandate. Next Wednesday, January 14, Oxford Economics’ Technology Practice Lead Ed Cone will be speaking with PwC’s Sayed Sadjady and SAP’s David Swanson on how companies are approaching learning and development. Attendees will be able to participate in a question and answer session with the hosts and will earn a unit of credit toward HRCI certification. You can register for the webinar here. With more and more companies turning to consultant, intermittent, and seasonal workers, the global workforce is demanding increasing flexibility. Our survey shows that employees are looking for less-rigid schedules and work locations. And while these benefits are not ranked as highly as cash-based rewards (like competitive compensation, bonuses, and retirement plans), 44% of employees say a flexible work location is very important to their job satisfaction. But managing a flexible workforce comes with a host of operational, training, and technology challenges—and there may be downsides for workers, too. In response to a recent report from the Inspector General of the US Postal Service, the American Postal Workers Union pointed out that these measures threaten stability and allow organizations to schedule workers according to demand. To successfully build a flexible workforce, companies must take measures to make sure that contract workers are not only leading to business success for the organization, but also furthering the goals of its employees. We are starting off 2015 with a handful of new webinars on our Workforce 2020 research. On Wednesday, January 14, Oxford Economics’ Technology Practice Lead will be speaking with PwC’s Sayed Sadjady and SAP’s David Swanson on how companies are approaching learning and development. Attendees will earn a unit of credit toward HRCI certification. Click here to register. Later in the month, stay tuned for other upcoming webinars that focus on the retail and financial services industries. Many use this quiet time at the end of the year to reflect upon the last year’s accomplishments and set strategies for the month ahead. As you think about your work strategies for the new year—including how you approach leadership, development, and even what is most important to you as an employee—check out our Workforce 2020 research. You can see the reports, fact sheets, and infographics on the SuccessFactors landing page, as well as our series of webinars on-demand. Our research shows that executives value loyalty more than job performance in employees—but most are not doing what it takes to keep their employees happy in their jobs. The holidays offer companies a host of opportunities to make their staff happy. From holiday parties to year-end gifts, management can show their employees how much they value them in various ways. As we have discussed frequently on the blog, the thing employees value most at the end of the year—more than any other job perk— is compensation and merit-based rewards. Just as the holiday season is a good time for companies to make staff feel valued, employees can also use the time to affirm their loyalty and commitment to the company—perhaps by setting new learning and development goals for the year ahead. Yesterday we hosted a webinar around the Germany-specific findings for our Workforce 2020 research (you can check out Germany’s fact sheet here). Our data shows that German executives are more concerned than their peers in other countries about shortages of skilled talent and are more likely to say difficulty recruiting employees with base-level skills is an issue. This problem extends past entry-level jobs and into leadership positions—42% of German executives say a lack of adequate leadership is a major impediment to meeting workforce goals, compared with 34% of global respondents. On a more positive note, German companies are also slightly better prepared to meet workforce challenges. In fact, 43% of executives in Germany say they are making good or significant progress toward meeting workforce goals—well ahead of the global total (34%). And while their use of metrics and benchmarking also suggests more maturity than other countries, like the rest of the world, Germany still has far to go when it comes to workforce strategies. As the war for talent heats up, companies will have to put more work into finding, recruiting, and retaining talent. Our research shows that currently, most are not doing what it takes to keep their employees at the company—and in fact, most do not seem to expect them to stay for long. 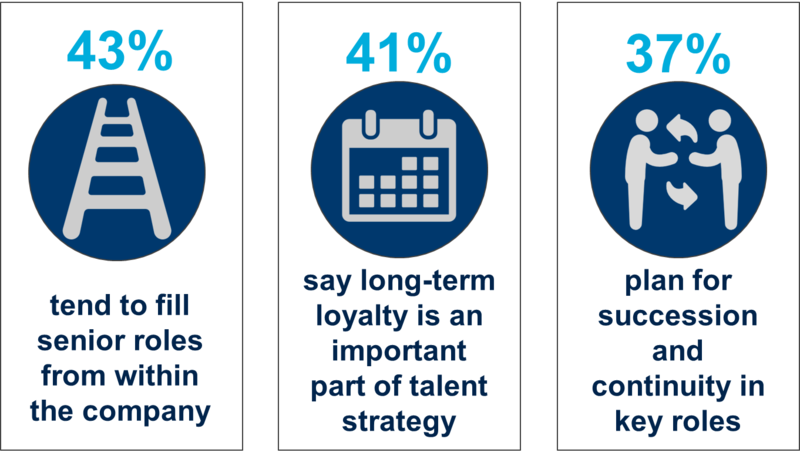 Executives are not filling roles from within the company, and most do not consider loyalty an important part of their talent strategy or plan for continuity in key roles. Executives may be underestimating employees’ willingness to follow a set career path within the organization: our survey shows that many employees are concerned about a lack of opportunities for advancement within their companies and are looking for more learning and development opportunities from their employers. The first step for companies looking to cultivate leadership may be to better understand what employees’ career goals are. Setting up mentoring programs—formal or informal—as well as regular meetings to discuss development opportunities may help define a career path and show executives which employees are most suited for advancement within the business. In the long run, those companies who cultivate loyal, skilled talent from within will have a better shot at success in the war for talent.